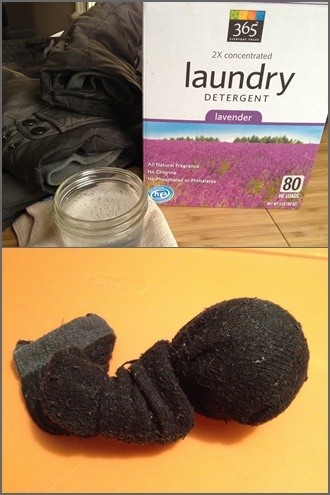 I used Whole Foods laundry detergent to pre-treat stains and to wash. An old sock and a tennis ball find unusual and noble work in my laundry room. Pre-treat stains by rubbing diluted detergent (1 TBS detergent with 4 oz of water) onto spots with a gentle cloth. You can also use a commercial stain remover as directed. Dirty spots on coats are usually around the collar, pocket openings, and sleeve edges. Using a natural detergent that doesn't contain fabric softener, wash according to the manufacturer's directions. (Jillee explains how to read the laundry symbols really well.) If the label is missing, setting the machine to warm wash and warm rinse should be fine. According to Marmot.com, it's a good idea to do a double rinse cycle when washing down. If your machine is old like mine, you'll need to turn the wash dial to rinse once the first complete wash cycle ends to make this happen. While your coat or comforter is in the wash, look for two clean tennis balls. Clean tennis balls don't really exist in my house thanks to my critter friends, so I put each not-so-dirty tennis ball inside of a sock and tie a knot at the ankle opening. When wash cycle ends, place the coat or comforter in the dryer set to low heat with the balls.The balls will bounce and toss around in the dryer and help fluff the feathers while they dry. Make sure the item is entirely dry but not over dry. Remove from dryer. great idea to put the tennis balls in socks! and good reminder I need to wash my down coat. thanks! No problem! Thanks for leaving a comment.